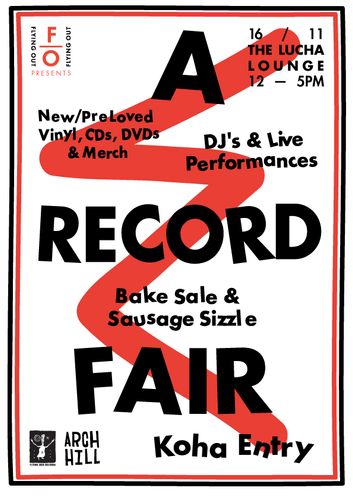 Sick of turning up to a record fairs and all the good stuff is gone? Tired of fairs starting at 7am? What about the fact the guy selling to you stopped listening to new music in the 70's? If these get your goat then make sure you head to 'A Record Fair' presented by Flying Out. Starting at the healthy time of 12pm at The Lucha Lounge (1 York St, Newmarket, Auckland), we will be hosting sellers of the latest vinyl, CD's, merchandise and aggregators of the finest 2nd hand wax. To set the mood we have enlisted the help of Under The Radar's Angela Windust, Public Address' Russell Brown and Kiwi FM's Charlotte Ryan to spin tunes. In between the jams Able Tasman Graham Hill will resurrect his Fafisa Organ to cover your favourite Flying Nun tracks. For those of you who like carbohydrates with your vinyl, Acting Up will be selling some baked goods, while a sausage sizzle will run for you "Ron Swanson" types. To boost our self-esteem, why don't you join our Facebook event!